June 15 was BBC World Music Day, and they called for change ringers to submit content. We attempted to do so, but were too late. However, in honor of the day, we celebrated by ringing in the park above Moonlight Beach in Encinitas. We were all able to attend, which hasn’t happened in quite a while. So 6 of us gathered at Moonlight Beach at 6:00 PM. We used our outdoor, Schulmerich bells, which sound very good outdoors. Sadly, this is a set of 10 bells, so we weren’t able to all ring at the same time. In attendance: Jane Booth, Karen Fitzsimmons, Maggie Fowlie, Genine Rainbeau-Heart, Jess Sorrell, and Randy Zack. The Encinitas Handbell Change Ringers. L-R: Genine Rainbeau-Heart, Jane Booth, Karen Fitzsimmons, Jess Sorrell, Randy Zack, Maggie Fowlie. We only rang methods we knew fairly well – Bob minor, Bob major, Plain hunt on 10. But we had great fun. Jess on the trebles, Randy on 3,4, Jane on 5,6, Genine on the tenors. Maggie watching the waves. Jess on the trebles, Karen on 3,4, Randy on 5,6, Jane on 7,8, Genine on the tenors. We captured some video as well. And we rang until the sun set. Afterwards, we retired to Genine’s house to have some dinner and conversation. Sadly, we have no photo evidence of the delicious food we had. But all in all, it was quite a nice way to celebrate. We had a special guest in our rehearsal tonight! Karen’s 4yo daughter Nola joined us for a short while. She had trouble ringing the bells without help, but she rang some rounds with us, with help from Mom. Very fun! Our band currently consists of Jane, Randy, Maggie, Karen, Genine, and Jess. We often have 5 ringers, and occasionally have 6 ringers, and sometimes have only 4. With these ringers, we are starting to make progress with bobs and singles. I am hopeful that we will do some long methods in the next few weeks, which we can post to Bell Board. Currently, we can ring bob minor with any combination of 3 people, and almost anyone in any position. There may be some who aren’t quite as comfortable on a particular pair. But the goal is for anyone to ring any position. We can consistently ring bob major with particular combinations. We are working to extend our capabilities in this area, trying to get everyone comfortable with all positions. We have not rehearsed bob royal with this band at all. We had a great rehearsal tonight. There were only 4 of us, allowing us to all ring all the time. We had Karen, Maggie, Lee Ann, and Randy (conductor). Karen and Maggie still consider themselves new (having each been ringing for about 5 weeks over 3 months). Karen and Maggie had mostly just done the coursing bells on plain hunt (the trebles or tenors). Karen rang the middle set on plain hunt on 10, once before. But since we could ring a lot tonight, Randy made them both learn all pairs of plain hunt on 6 (before Lee Ann arrived), and then ring the 34 pair on plain hunt on 8. They both did fabulously! Randy was learning and stretching a bit tonight as well. He watched everyone, and was able to help correct people when they got lost. While he has done that some in the past, tonight was much better in being able to see full patterns. At the end of the evening, Randy explained plain bob minor to Karen and Maggie, without actually ringing any bells. So far, it all looks very confusing to them. Remember your first time? No real milestones tonight, but some good repetitive ringing for all. Our first rehearsal of the new year saw us ringing with two visitors, two (fairly) new ringers, and one returning ringer. Genine has returned to us. Since we moved our rehearsals to Thursday evening, she has not been able to join us, due to classes she is taking. But a new semester has started, and she has arranged her schedule to keep Thursday evenings free, allowing her to return to us. In my last post, I mentioned Maggie, who continues to ring with us, and is learning quickly. We also had another new joiner at about the same time. Karen started ringing with us in the late fall. Interestingly, Maggie and Karen have been traveling, or ill, or home with sick children, and so until this week had not met each other, even though they had each attended a few rehearsals at the end of the year. Karen is also learning quickly. It is fun to teach new ringers about how to change ring. This week also found us with two visitors. Andrew lives nearby, and goes to school at Purdue. He was home for the holidays, and asked to join us in our rehearsal. He learned change ringing while studying abroad last year, where he joined a group of handbell change ringers and a group of tower ringers, both at St. Vedast, learning under Thomas Lawrance. He has rung a quarter peal on handbells with that group. It was fun to have a visitor at all, and to have one who knows how to ring Bob Major was a real treat. We hope he will visit us again, whenever he is in town. Andrew’s friend Elizabeth also joined us this week. She is also local, and is going to school at Syracuse. She joined Andrew’s handbell group while visiting him in London, and picked up ringing quite quickly. This was only her second time change ringing, and we hope she returns to us whenever she is in town. With all the new people, and visitors, and returning ringers, we had eight people ringing, which I think is the most we have ever had at a single rehearsal. Quite fun! With so many new ringers, we decided to split into two groups of four, and ring a lot of Plain Hunt Major. 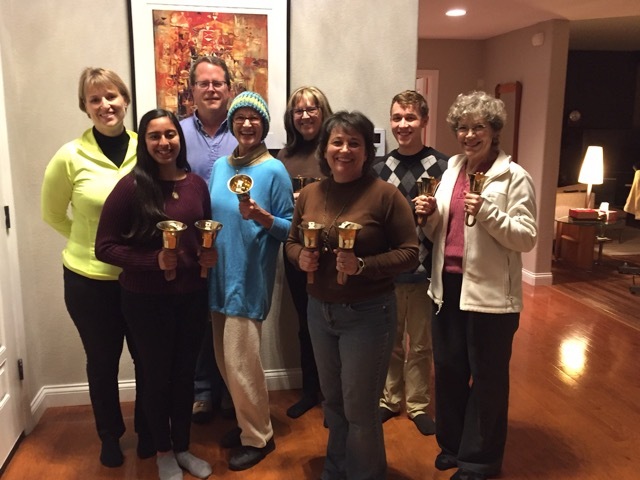 Each group had new ringers, and each group was able to ring a full course. Granted, that’s just 16 changes, but with so many new people, we considered it an accomplishment. We even rang for each other, with each group of 4 ringing Plain Hunt Major for the other group to hear. Good fun. After some more Plain Hunt Major, we decided to try Bob Major. Ange took the new ringers to ring Plain Hunt Major, while Andrew, Jane, Genine, and Randy rang a plain course of Bob Major. There were some small mistakes, but we actually rang the whole thing. I believe that was a first for Andrew. And gave us all a feeling of accomplishment for the evening. We finished the evening ringing Plain Hunt on 12. It took a few tries, but we finally got it. The new ringers were ringing the trebles and tenors, so all they had to do was course. The rest of us had to do some serious counting. A wonderful rehearsal, all in all. Here is a photo of the full group. L-R: Karen, Elizabeth, Randy, Genine, Jane, Ange, Andrew, Maggie. We regretfully lost two members this past week. Sally has moved to Alabama, and Paul to Minnesota. We’re hoping one or both will return soon. Until that time, they will be sorely missed. But this loss was offset by the possibility of gaining a new member. Maggie came to ring with us today. She has rung in a tune ringing choir, and heard about change ringing at a recent Area 12 Spring Ring. She caught on very quickly, ringing the trebles for Plain Hunt on both 6 and 8 this evening! We’re hoping that she can ring with us more often. While Maggie was resting from cramming all this information into her brain, Jane, Paris, Ange, and Randy started working on ringing a long touch of Bob Major. We started with a simple plain course, since Paris hasn’t rung with us for a few months. After doing so, we started with some bobs, just to get used to them. We hope to ring a celebratory quarter peal in honor of Paul’s newborn, scheduled to arrive in November. We have a lot of work to do!